A poor family on welfare, a busy professional who keeps missing deadlines and a loner who struggles to make friends may share nothing in common at first glance. A closer look, however, shows that each of these people is grappling with not having enough: The family doesn’t have enough money, the professional doesn’t have enough time and the loner doesn’t have enough social connections. The common condition that they share is scarcity, or the feeling that they don’t have as much as they need. Whenever scarcity becomes a part of life, it causes observable changes to the human brain. Today’s most progressive economics programs, such as American University’s online MA in Economics, are blending traditional economics with what social scientists call “behavioral economics.” Traditional economics assumes that all people act according to rational self-interest. 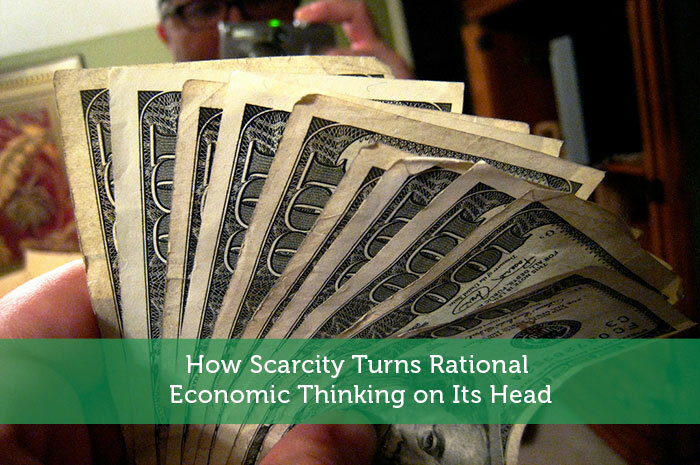 Scarcity tends to promote non-rational behavior, the type of behavior documented and analyzed by behavioral economists. Essentially, scarcity creates conditions in the brain that limit the way it functions. People who deal with scarcity may not have the capacity to act in their own self-interest. Sendhil Mullainathan, professor of economics at Harvard, and Eldar Shafir, Princeton’s William Stewart Tod Professor of Psychology and Public Affairs, recently published a book called “Scarcity: Why Having Too Little Means So Much.” They noted two effects of scarcity: the focus dividend and the bandwidth tax. Focus dividend. A month before a major project is due, the mind feels no sense of urgency. The week before the project is due, the project becomes one of the mind’s major focal points. As time becomes scarcer, the mind becomes focused on the task, which is helpful. However, the mind also starts to tunnel, which means that it focuses almost entirely on the scarce resource. People neglect tasks that are for their long-term good, like buying health insurance, because they perseverate on short-term scarcity. Bandwidth tax. In addition to impeding prioritization, scarcity reduces cognitive bandwidth. It becomes difficult to solve novel problems that are unrelated to the scarcity. A brain function called “executive control” inflates scarcity to the exclusion of other thoughts. The same function that makes texting and driving impossible focuses the brain on scarcity and doesn’t admit other stimuli. When people have scarcity on their minds, they have less mental capacity for everything else. A single mother in a welfare-to-work program who has just started a minimum wage job, for example, often has to work odd hours, holidays and weekends. She has limited financial resources to tackle obstacles such as finding child care and purchasing reliable transportation. Going to work could also mean the trade-off of spending less time with her children. When her car breaks down, she may have no slack in her budget to pay for the repair. The scarcity of money for the repair, coupled with the scarcity of time to spend with her children, may cause her to stop showing up for the job. Of course, the job could be a way for her to improve her long-term financial situation. However, scarcity involuntarily focuses her mind on immediate shortages and leaves less capacity for considering long-term strategy. In the economy at large, businesses that suffered losses during the recession of 2008 have demonstrated unwillingness to increase their workforce or to increase their wages for ordinary workers. As a result, unemployment remains high, and people have less and less disposable income. Scarcity causes company managers to hoard cash, but by hoarding cash, they create a group of workers that don’t have the disposable income to purchase their products. By keeping employees poor, they inadvertently erode their customer base and their long-term sustainability. Mullainathan and Shafir recommend finding ways to introduce slack into the budget, whether the budget is for time, money, relationships or calories. For example, a savings account for unexpected shocks keeps people from slipping into a scarcity mindset. An extra workout each week lowers the negative effects of a diet slipup and prevents feelings of failure. Another of the researchers’ recommendations is to invest in scarcity management. Investing in additional tables at a busy restaurant may be expensive upfront, but the ability to serve more customers will increase revenue in the long-term. In business and in life, people must avoid mortgaging the future because time or resources seem scarce in the present.